Grow your Store, Grow the Game – Star City Games In-Store Programs Homepage! 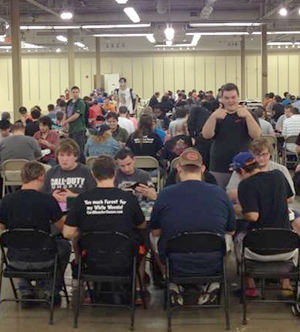 CM Games in eastern Tennessee has run StarCityGames.com Invitational Qualifiers since the program began, part of a fourteen-year stretch of running Magic: The Gathering events. Their six stores and player bases have grown along with the In-Store Programs. I asked Mat and Steve, the tournament organizer and owner, respectively, how our program offerings have benefited them over the last three years. I began asking about the pros and cons of running so many Magic tournaments at multiple stores and there were surprisingly few cons for CM Games. While they had some issues when they started running events at more than one store, things are now running “like clockwork.” The largest pro is their ability to advertise in-store and via word of mouth through their network of stores. Of course, they have to plan meticulously to prevent overlap while avoiding conflicts with other events in the area. StarCityGames.com has offered us some great opportunities to run some really high level events with great advertising, and we’ve been able to run some really awesome events because of them! Magic has experienced a boom in the past four years and CM Games has benefited from this. “StarCityGames.com has offered us some great opportunities to run some really high level events with great advertising, and we’ve been able to run some really awesome events because of them! Additionally, we’ve been able to run many PTQs thanks to the growth of the game, and due to the growth of player bases in surrounding areas CM Games has added five new locations since it first opened.” One of the major goals for In-Store Programs here at StarCityGames.com is to partner with local stores like CM Games and improve the local player base, so this is great for our team to hear! CM Games has locations all over eastern Tennessee. You can learn more about their upcoming events on their main location’s Facebook page. Planning for Success Part 2 The Game Night Event Finder is Now Live!